e-Navigation concept is developed by the International Maritime Organization (IMO) to improve shipping through better organization of data on ships and on shore, and better data exchange and communication between ships and the ship and shore. The project contributes to the development of software and equipment for implementation of the e-Navigation concept as well as development of commercial products for e-Navigation which are based on the solutions developed under the given project. In terms of implementation of the IMO e-Navigation (Strategic Implementation Plan), the most important result of the project is the Russian segment of Maritime Connectivity Platform which brings skippers, offices of shipping companies, port services, vessel traffic control centers, and other providers together within the «Ship-Shore» single information space. Creation of this platform, which is called as «Maritime Cloud», will ensure compliance of Russia with obligations in the context of the International Maritime Organization (IMO) from one side, and from other side it will provide maritime information services for the seas of the Russian area responsibility. That is why the government structures and coastal facilities of the Russian Federation, as well as port authorities subordinated to the Rosmorport and authorities of regional vessel traffic management systems will be basic users of this platform. Registration of maritime services and their provision on request of commercial users including foreign providers and ships will be an additional source of commercialization for the Maritime Connectivity Platform. Firstly, the contribution to it will be integration of the Russian segment of the Maritime Connectivity Platform with foreign segments of the Baltic Sea and Arctic zone of Europe in the context of EfficienSea2 project, and secondly, spread availability of maritime services for other offshore zone including Russian Northern Sea Rout. 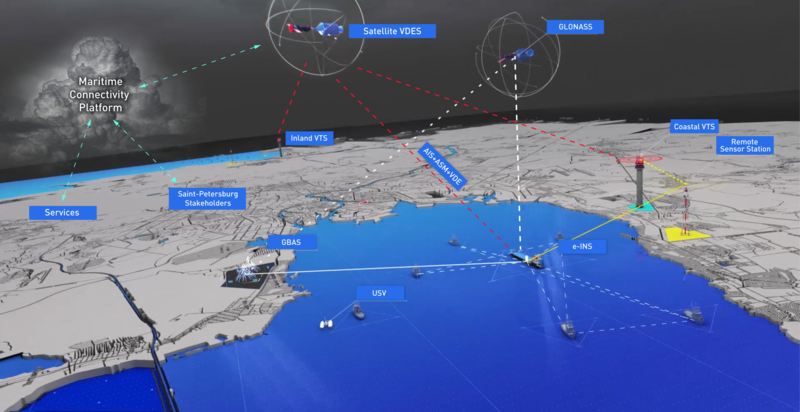 As the Maritime Connectivity Platform is not able to meet all requirements without telematic communication channels, the VDES shore station developed in the project which is being integrated into single information space will be a key element for commercialization of the project results. Equipping of the existing shore vessel traffic management centers with this station, as well as provision of the shore broadband satellite communication since 2021 will enable to arrange a seamless roaming for maritime information services. Creation of this station also opens the market for replacement of the existing AIS shore stations both in the area of Russia and abroad, first of all in the countries of EAEU and BRICS. It is planned to use capabilities of the Chamber of Commerce and Industry of Russia to create own dealer network for promotion in these markets. Now there are some preliminary agreements with partners from India and Peru on promotion of Kronshtadt Technologies’s products to the markets of Asia and Latin America. The ship Integrated Navigation System (INS) oriented for usage of e-Navigation services will have an independent commercial demand. Certification of the Russian Maritime Register of Shipping opens way for this system to the world integrated ship systems market, which is evaluated as equal to the amount of more than 4 BUSD by 2021. The Company is planning to come in this market and secure a foothold in it.